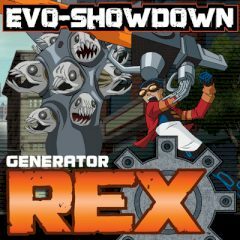 Rex has never experienced so enormous amount of Evo monsters at the same time, but considering the fact that he is unique and can control them it is more than just possible. Remain calm and attentive and use your weapons against these monsters! Rex finds himself at the vast location full of Evo monsters around and it seems like no end to this. There is a chance to escape it and leave the place on your both, but you have to kill them all first. Fortunately, you have three weapons on your choice and if you use them smart, they won't do anything to you. Raise your blade and cut them into pieces collecting bonuses that increase your power.